Katie is an Accredited Exercise Physiologist who has a passion for empowering others to achieve their optimal self and life experience through exercising and becoming exercise wise. 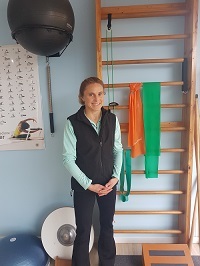 Katie has worked five years in the hospital sector within a multidisciplinary team environment specialising in musculoskeletal rehabilitation. Katie has extensive experience working with chronic pain and functional restoration programs. Her varied caseload included Work Cover, TAC, DVA and private patients with complex medical conditions. Katie can assist with setting an individual up on the right exercise path to meet their individual needs and goals, educating the importance and benefits of exercise in the prevention and management of chronic diseases, learning to exercise while managing a medical condition or injury, correcting body mechanics with activities of daily living, injury prevention and specific conditioning for a sport/occupation/personal goal. Katie is looking forward to working with you to assist individuals to become more active and enjoy the benefits exercise has to offer them. Katie takes private, EPC, DVA, TAC, WorkCover and NDIS patients.